When the HongKong-Zhuhai-Macau Bridge, or HZMB, was completed in January of 2018, it became the longest sea crossing bridge in the world. With a total length of 55 kilometers, the structure is impressive to behold, but the engineering behind it is even more incredible. 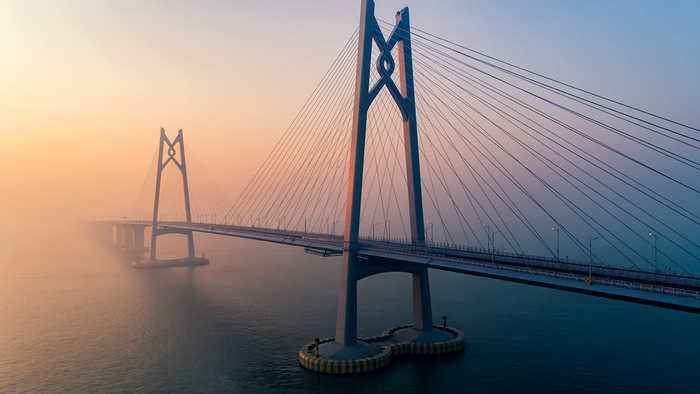 The goal of the bridge was to connect the major population center of Hong Kong on one side of the Pearl River Delta to Macau and Zhuhai on the other. Normally to go between the cities requires driving around a large bay, and a more direct path could take two hours off the trip. Making such a long bridge required careful planning from the HZMB’s designers. They had to build it to withstand the annual typhoon season, the occasional earthquake, and the ever-present sea. And their goal is to make it last for for 120 years. They also had to account for its location, cutting across five shipping navigation channels and the flight path of aircraft taking off and landing at Hong Kong International Airport. Finally, they had to consider the local marine life, like the Chinese white dolphin, and the impact the construction and presence of the bridge would have on the ecology of the region. The first most obvious challenge when building over water is the fact that there’s no land to build on. That’s kind of the whole point of the bridge, so you need to start with a stable base. However the first solid ground you run into under water isn’t usually ideal either. In this case, there were weak marine deposits that don’t make for a solid foundation. To overcome this, builders drove long poles called piles down through the sediment. Piles used in the Hong Kong link road portion of the bridge could be as wide as 2.8 meters, and in a few cases were over 100 meters long to reach a stable foundation.